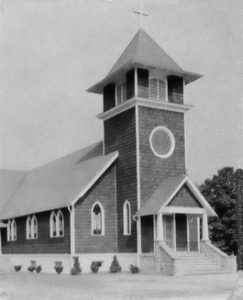 On June 20, 1948 Bishop William J. Hafey dedicated the Our Lady of Victory Mission Church to service the people of the Tannersville area Twenty years later, with the Pocono population steadily growing, this little Mission Church became a parish in its own right. In 1968 Rev. 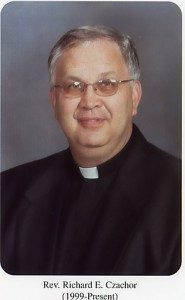 Henry E. Zapotocki became the first pastor of the now Our Lady of Victory Church & Parish. 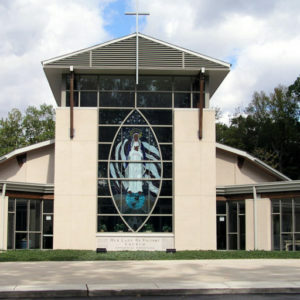 Soon after coming to the parish, Farther “Z”, as he was affectionately know by the parishioners, had the foresight to know that the Old Mission Church would soon be too small to handle the constantly growing Catholic population in the Pocono’s. Almost from the beginning, there were hopes, desires, prayers and plans for a new and larger Church in the Tannersville area. The original parish started with seventy families. Today that number has grown to over 1,200 families. This little mission Church was bursting at the seams. In July 1999, with the retirement of Father Zapotocki, Rev. 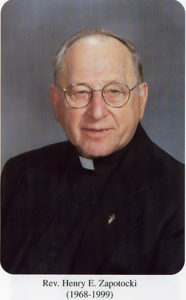 Richard E. Czachor became the second pastor of Our Lady of Victory Church. Under the direction of Father Czachor with Father Zapotocki’s groundwork and a strong and energetic building committee, our new Church on Cherry Lane Road w as built. On Sunday, June 30, 2002, a special ceremony closing the old Church on Route 611 was celebrated. Pertinent religious symbols, Baptismal Font Cover, Altar Stone and Tabernacle Door were removed from the old Church and ceremoniously brought into the new Church on Cherry Lane Road. The same afternoon, Most Rev. James C. Timlin, Bishop of the Diocese of Scranton, opened the new Church with a special Mass and dedication ceremony, and a new era in the parish life of Our Lady of Victory Church has begun.